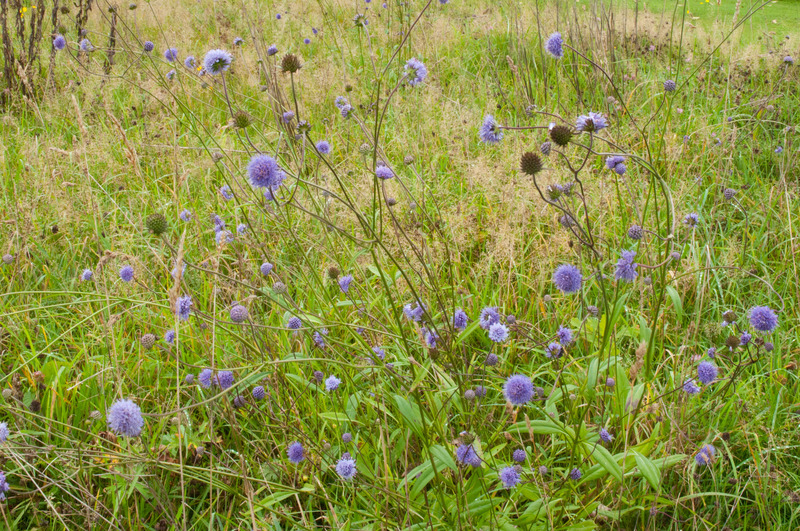 seemingly springing-up from nowhere in the middle of surrounding fields. 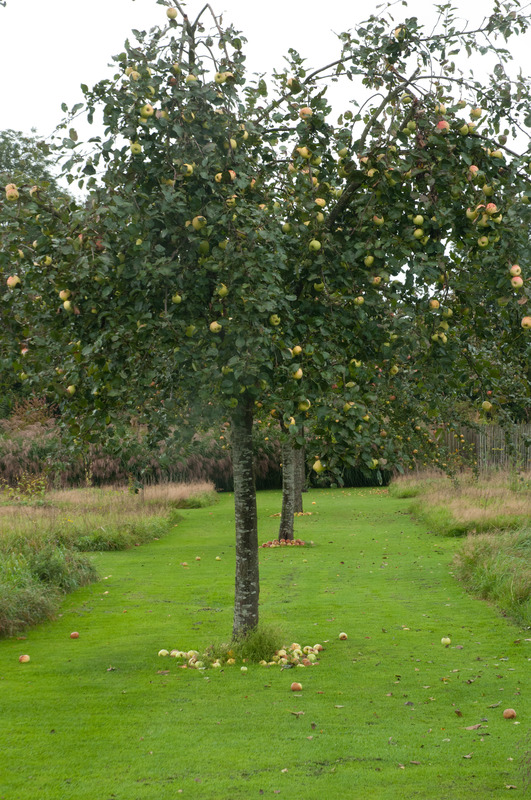 After a rainy drive down, the skies started to clear as I wandered through the tempting nursery area into the orchard of the main garden. 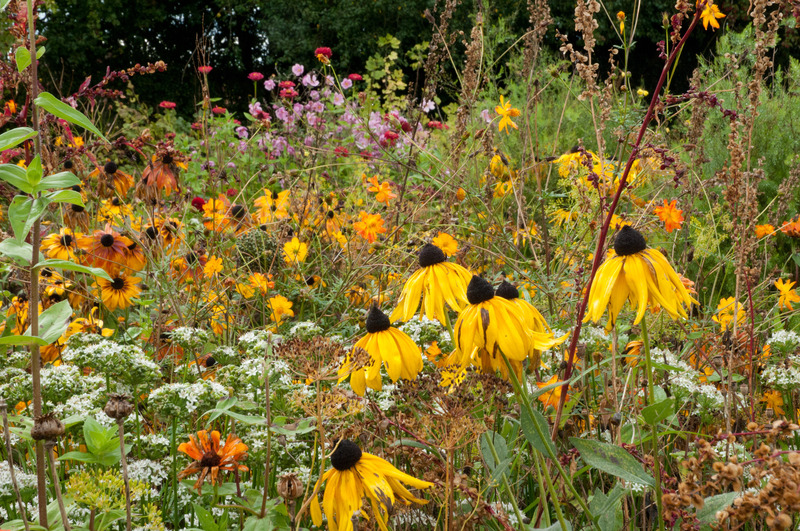 What hits you first is the sense of space, which affords the opportunity to plant a whole series of large beds which in turn create rhythms throughout the garden. 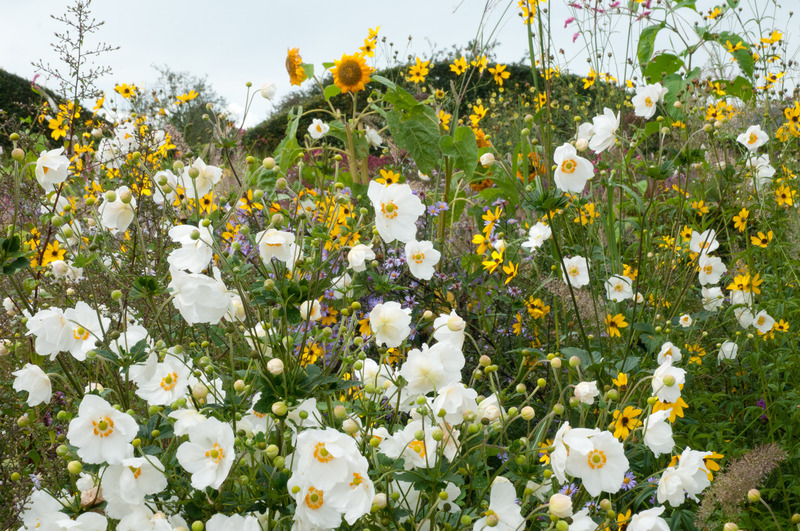 Nine separate gardens are planted to perform at their best at different times of the year, and arriving in mid September, the Autumn garden was a dream to enter into. I almost felt hugged by the plants as I slowly wandered amongst the swaying grasses, gazed at the Persicarias (in all shapes and sizes), marveled at oodles of Verbena bonariensis and took in the heady scent of and glowing wands of Cimifuga atropurpurea. There’s a lot packed into this garden! 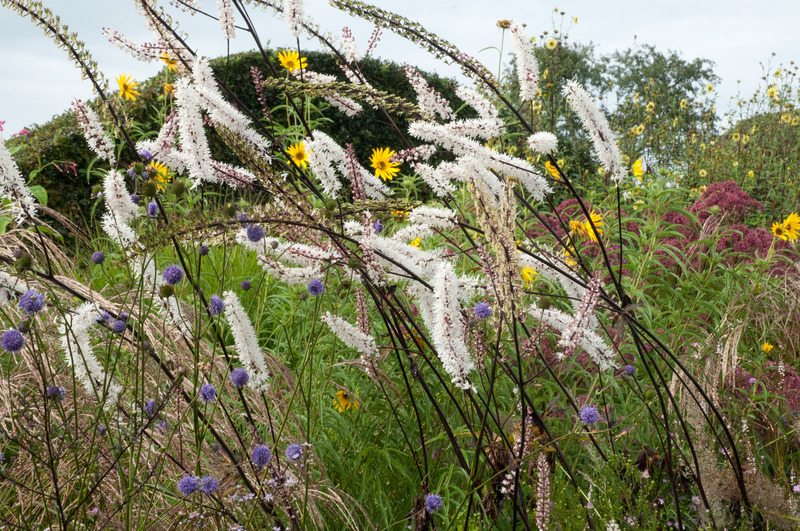 Visiting a friend’s garden in Walthamstow recently, at over 6ft tall, he explained that he liked to plant huge grasses and other large plants as he like the sense of feeling small and contained. I think he would love to be in this garden. 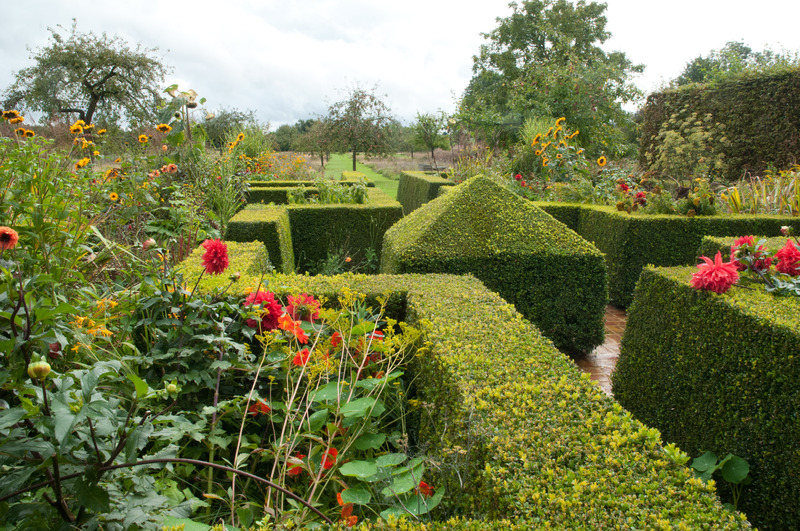 Surrounded by curvy hornbeam hedging, the garden is created as small blocks within a larger block. Each block has its own mini theme which in turn ties in to a larger theme. 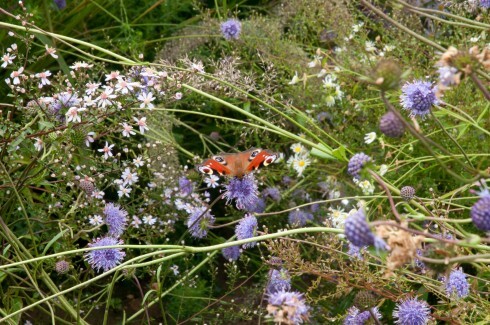 and full of bees and butterflies. I loved it. 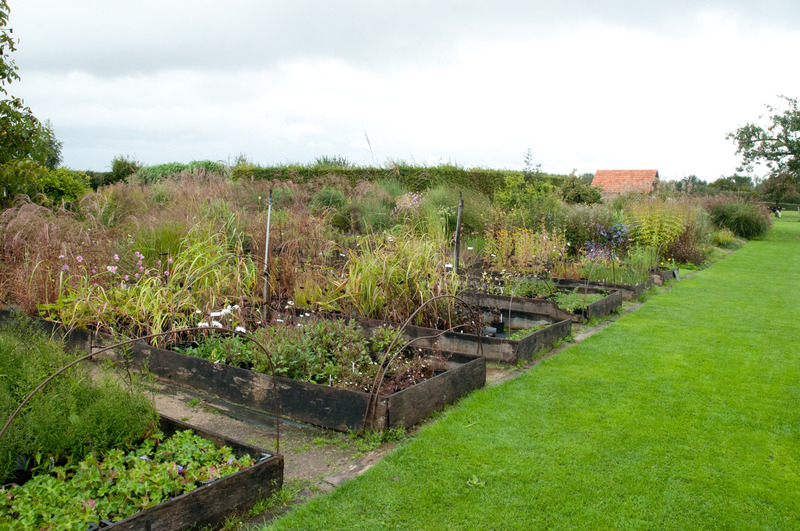 From spring to summer was a tad more of the formal side, with box hedging containing hot reds and yellows tempered by more varieties of grasses. 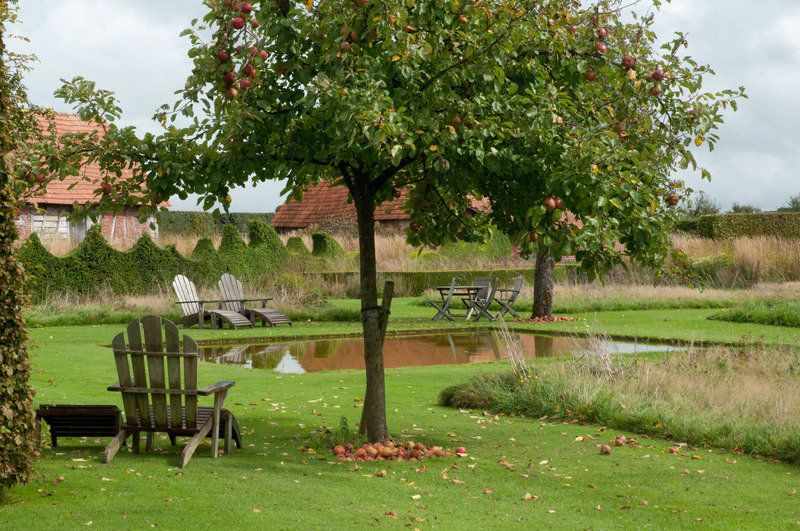 All gardens lead back to the calm and spacious orchard where you can sit back and take time to enjoy this thoughtful garden. 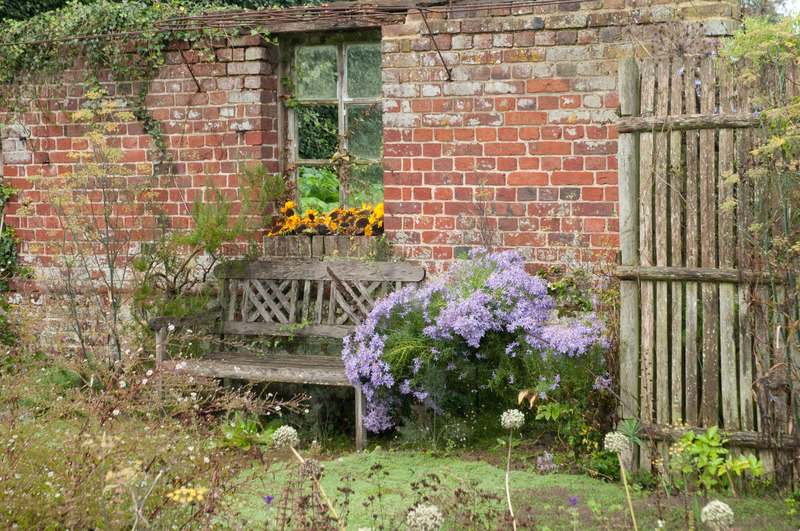 and more stylish seating to take a moment or two to soak up the wonderful planting. 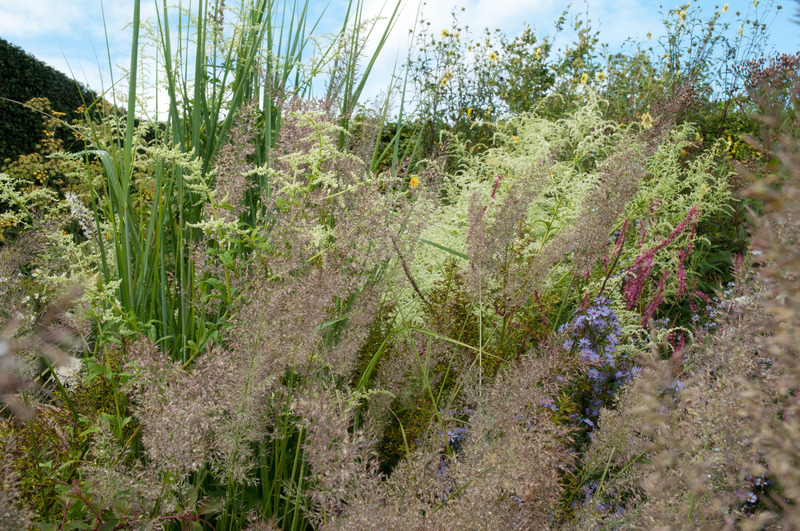 Passing through the ‘potager’, you arrive at another quiet contemplative area, where swathes of Miscanthus gently nod in the breeze and offer to hug again. 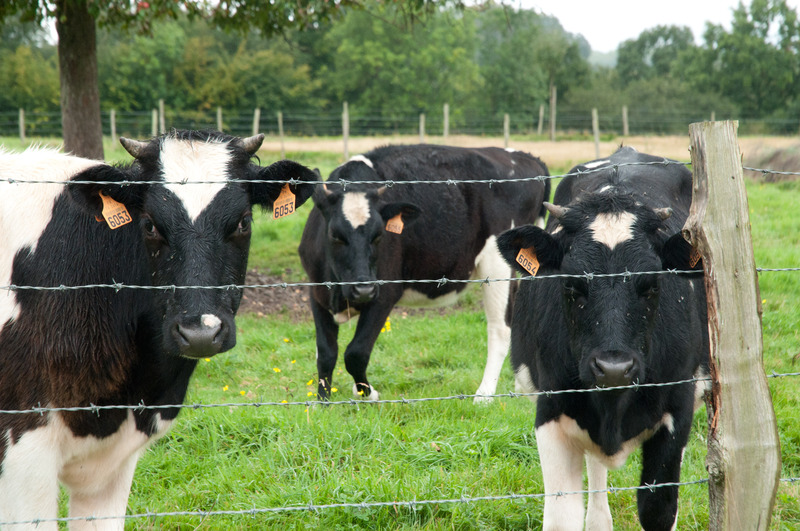 And finally, as you leave, you pass through the nursery again. 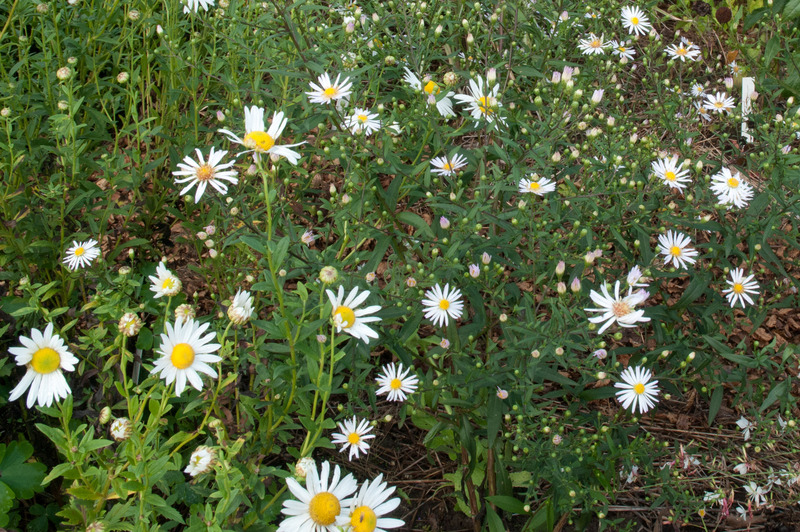 Le Jardin Plume have started to build up a number of their own plant varieties from over the years and Sylvie delighted in showing me this very elegant white Aster ‘Dentelle de Constance’, which is still going through its trial period. 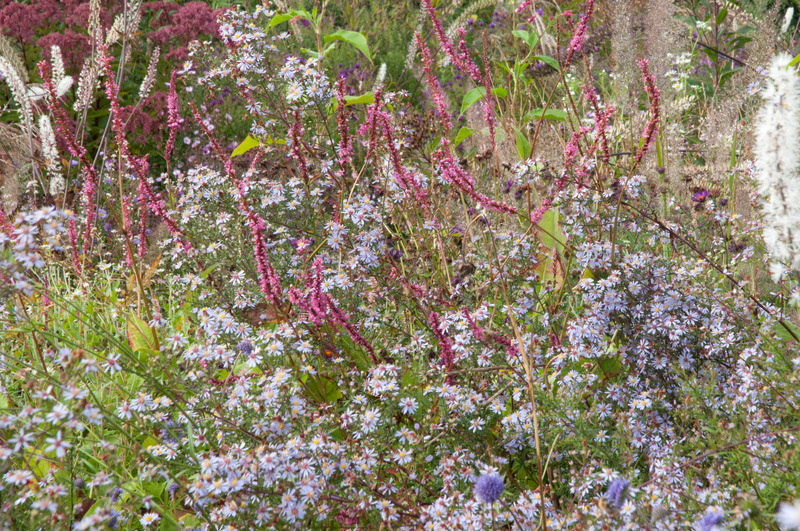 and I couldn’t resist buying a couple of Succisa pratensis (Devil’s bit scabious) which looked so wonderful with the late Asters in the autumn garden. This is my first visit to Le Jardin Plume, but hopefully I’ll be back again soon to see how it changes throughout the seasons. 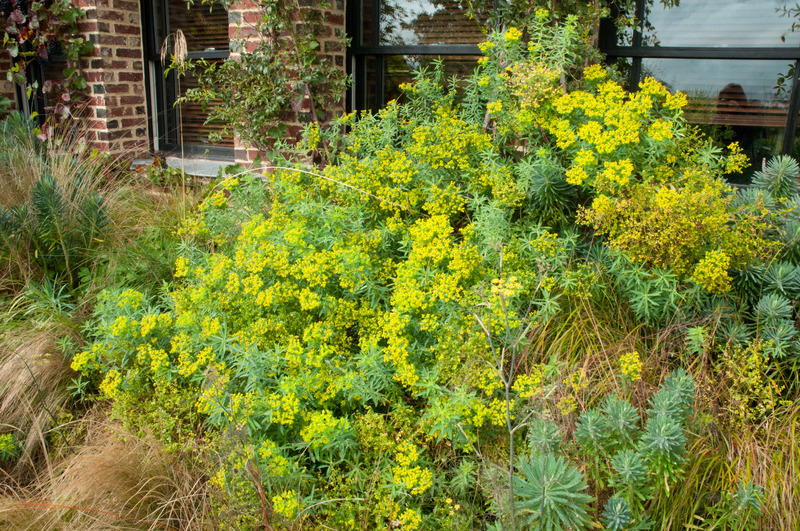 What a wonderful garden – I love the ‘loose’ planting style, right up my street. WOW! Really envious. Will definitely put that one on my list! I’m glad I took time to go on that journey round Le Jardin Plume – relaxing and fun at the same time. I particularly like the box balls……. 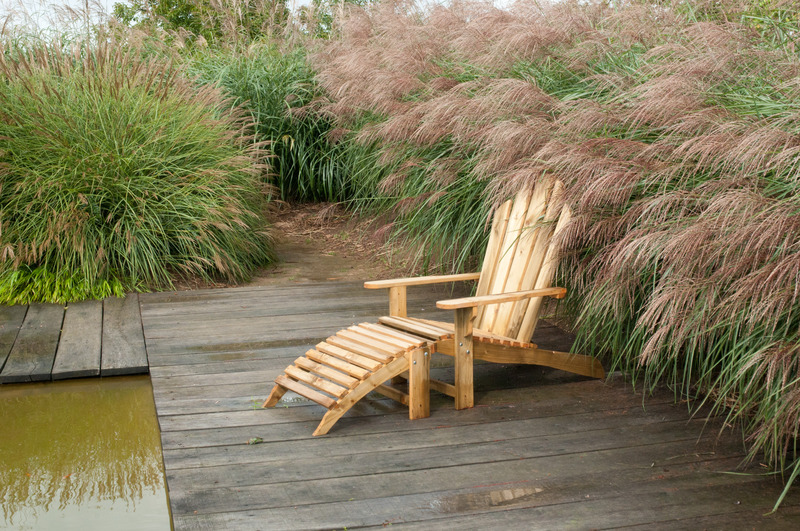 I love that miscanthus and it looks especially good next to the decking. And yes it would be fascinating to see it in another season. 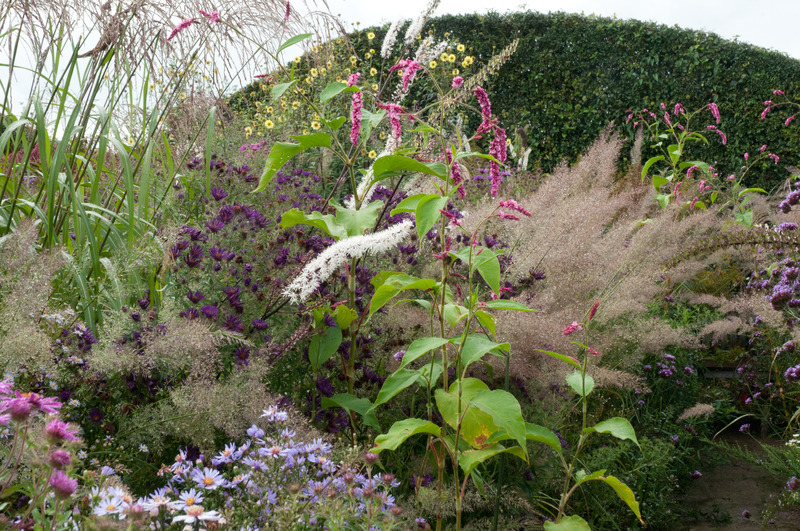 Sue, I love the use of Miscanthus en masse too. I think this is one of Le Jardin Plume’s own varieties too. Gorgeous! I knew Normandy was the place for great gardens. Where exactly is this? We are creating a garden in the south of France (near Carcassonne) which is a real challenge for an ‘English gardener’ whose previous garden was in Oxfordshire. Wish we had bought a house in Normandy now seeing this amazing garden. I particularly loved the box balls, the pool and orchard and the seating. Will definitely try to visit this garden. 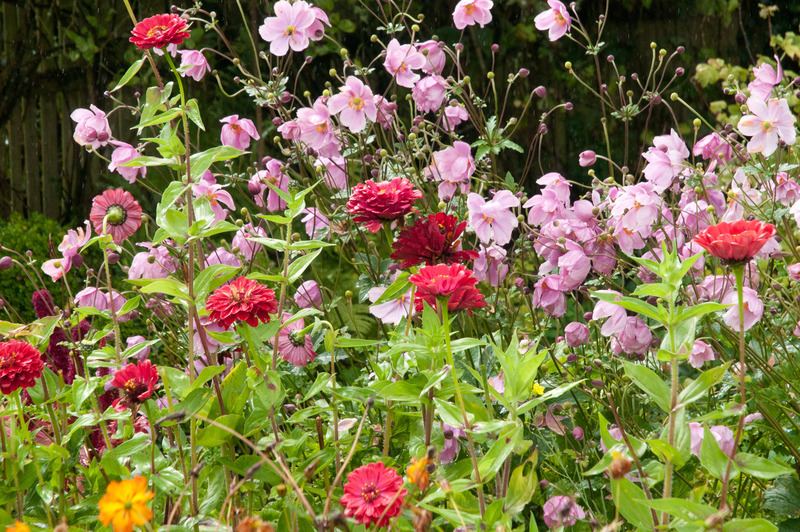 Any tips for our hot, dry southern garden will be gratefully received. Its such a wonderful garden. Än your pictures are just so beautiful. Hope everything is ok with you. And dpo bring your camera and visit Sweden soon. Beautiful garden! 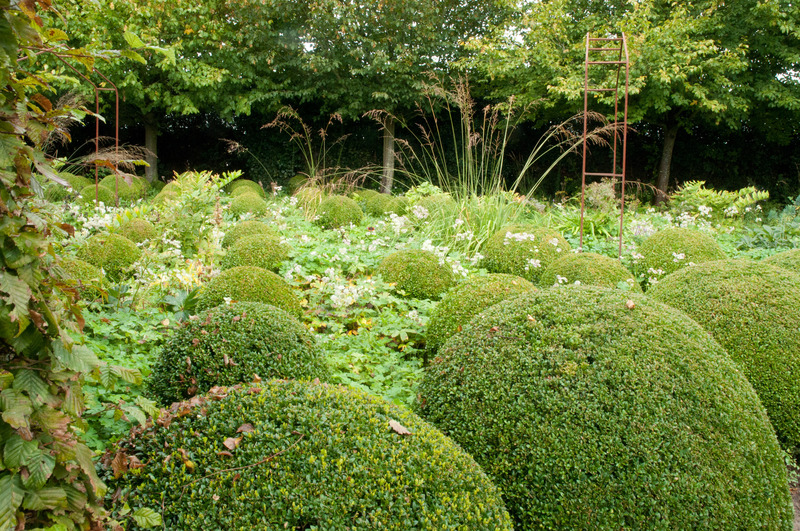 I so enjoyed the plantings you featured, particularly the ones with the Cimicifuga and the box balls. 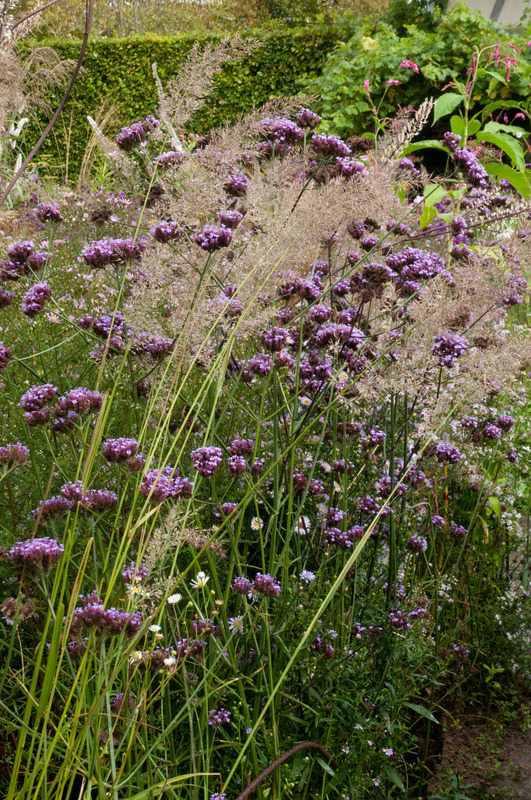 How very beautiful – those grasses are wonderful, but it is a shame the potager has gone (though there’s compensation)… I’m in love – I want Succisa pratensis too! 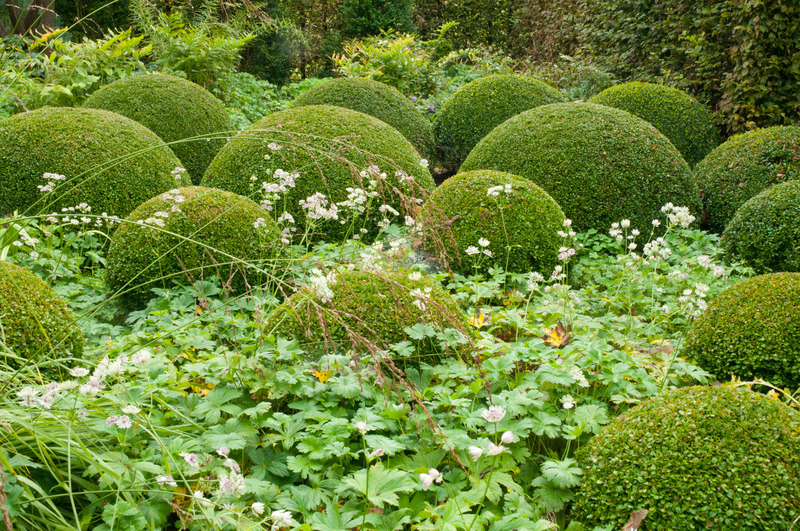 Dear WMG, Yes, those box balls are certainly an idea I’d like to create/steal when I have the larger garden of my dreams-fabulous all year structure with the gorgeous addition of Astrantias-still have Astrantias flowering for the second time at the moment too in my garden. I love too much your blog that I found only today! Thanks Tiziana! Yes, hopefully might visit again later this year. Can’t wait. any idea what the grass is in the first pic in the square boarder and also the miscanthus behind the sun longer? they look amazing. 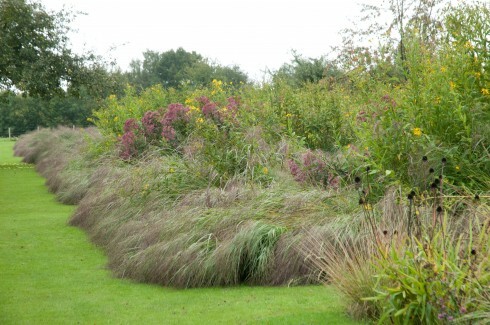 Oops, Calamagrostis is in fist pic, but not the square borders,. Will ask what these grasses are too when I’m there. …i wouldnt have guessed they were those varieties. 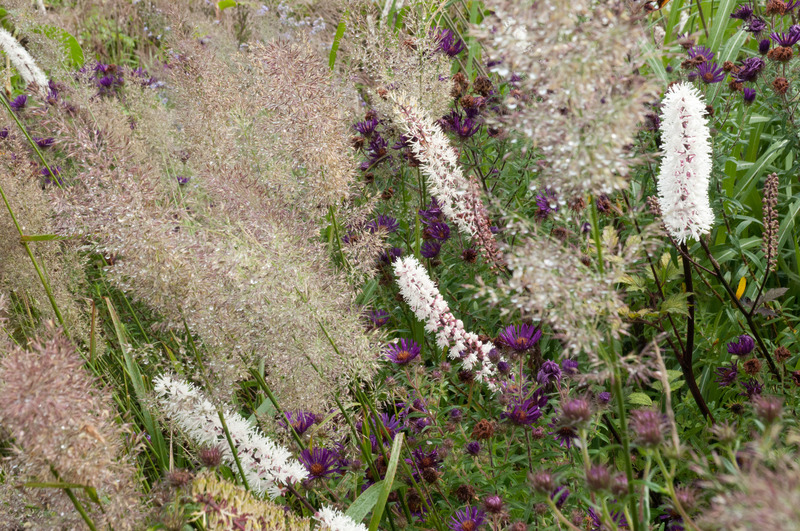 I still have no idea what the grass edging the square bed is, it’s definitely brachytricha in the pic below. it almost looks like some sort of eragrostis african love grass but i dont think it is though.